We at Daystar Life Center of Citrus County work to make a positive difference in people's lives. Our principal service is to provide immediate assistance for the basic needs of individuals and families with low income who reside in Citrus County, Florida. We offer primarily food, clothing and financial help—mostly rent and utility assistance. We also try to connect the poor and the homeless to opportunities for improving themselves or their conditions. Therefore, we remain active in various community networks in order to make the connections that are most beneficial to lifting people out of poverty or to addressing the causes for their difficulties. Daystar relies on the community networks available through our active memberships in the following: Community Alliance of Citrus County, Mid Florida Homeless Coalition, United Way of Citrus County, Nature Coast Volunteer Center of Citrus County, Community Food Bank of Citrus County, Citrus Health Improvement Partnership, Transportation Disadvantaged Coordinating Board, and Citrus County Chamber of Commerce. Our Executive Director is also an active member of the Central Citrus County Rotary Club and the Inverness Elks Lodge 2522, both of which provide valuable resources and additional networks of support to Citrus County and charitable organizations like Daystar. Before we offer any services, we conduct interviews of those who are seeking help in order to determine if they meet our eligibility criteria. We are careful stewards of the resources that are given to us. Therefore, we try to verify the needs of those who come to us and then work to help those found to be in a critical state. If we are unable to provide the help they need, then we try to guide them to the appropriate people or places. We also provide a desk with both telephone and Internet access, so that clients may make contact with the referrals we suggest. Daystar was established in 1983 by Father James Hoge and members of St. Benedict Roman Catholic Church in Crystal River. It started as a small food and clothing ministry in a nearby house owned by the church. At that time there were other Daystar Life Centers in Florida. Some of them still exist, but each Daystar is separate from and unaffiliated with the others. The name “Daystar” comes from two citations in the New Testament of the Christian Bible. Jesus refers to himself as the daystar, or morning star, in Revelation (22:16). In the second letter of St. Peter (1:19) Christians are exhorted to practice the teachings of Jesus until he rises within them like the daystar. The daystar, or morning star, is the planet Venus brightly reflecting the sun before it dawns. Daystar Life Center of Citrus County is an official ministry of St. Benedict Catholic Church under the auspices of the Diocese of St. Petersburg. Daystar is recognized by the Internal Revenue Service and the State of Florida as a 501(c)(3) charitable organization. Therefore, donations made to Daystar are exempt from federal tax. In addition to St. Benedict Parish, Daystar is equally supported by the Catholic parishes of St. Scholastica in Lecanto and Our Lady of Grace in Beverly Hills. Other Catholic parishes and local Christian churches also provide support to Daystar, which makes us a true ecumenical ministry. From the different congregations or their organizations we receive volunteers, food or money for the Food Pantry, donations of money for Social Services, or items for the Thrift Store. Because of the ever-increasing number of people being served, Daystar has grown through the years not only in the number of services offered, but also in volunteer and donor support, and in real estate. It was in 1999 when we moved to our present location. The land and permanent buildings are owned by the Diocese of St. Petersburg. Daystar is solely responsible for all costs associated with the maintenance and improvement of the buildings and grounds as well as the costs of utilities, insurances and county fees. The diocesan property was previously used as the campus for the first Catholic school in Citrus County. 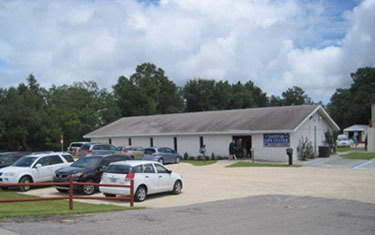 The Thrift Store is located in the former chapel. The former schoolhouse, now known as the Father Hoge Building, contains the Food Pantry, an administrative office, a conference room and storage rooms. The expansion of Daystar continued with the purchase of modular or pre-fabricated buildings. The largest of these is the Social Services Office, where clients must go to register and be interviewed if they are seeking any of our services. Four smaller outbuildings are used to display and sell furniture, large appliances, beds, mattresses and wall art. Another two outbuildings are used for storage and as a maintenace shed. Daystar Life Center is recognized in Citrus County as a primary resource for the poor, the homeless and struggling families with children. While there are many places people may go for food, clothing or financial assistance in the county, we are one of only three charitable organizations that offers all three services five days a week throughout the year. And we three organizations serve income-eligible clients from throughout Citrus County, not just people in our immediate areas. As long as clients meet the guidelines that we use to define poverty or homelessness, Daystar Life Center serves Citrus County residents regardless of religion or creed, race or color, gender, gender identity or expression, sexual orientation, marital or familial status, age, physical or mental ability, ethnicity or national origin, or military or veteran status.